Sneaker head. Am I one? No, not really. Was I one? You bet! And it’s not that I’ve lost my love for the athletically inspired staple of streetwear fashion, that is the sneaker. I still love them just as much as ever, and more now even then I have in a little while. For a good amount of time, my main footwear choices have all been brown and leather, Wallabees, boat shoes (many different colors), desert boots, loafers, what have you. And no, I haven’t thrown these out either, but I’ve grown most recently to mesh these two footwear styles together, working them into a greater palette of style. It’s not that I’ve suddenly come into more clothing, it’s that I’m trying to utilize more of it now. Unfortunately, I wasn’t wearing sneakers too much at the start of the school year, so I only have ten pairs here. The rest are in storage, at home. Now I want them all here. My freshman year, I had many of them at school, but rarely did several of them get runs outside of my dorm room. If you’re of the sneaker addict ilk, then you will know where I’m coming from! My favorite shoes, I never wanted to wear! 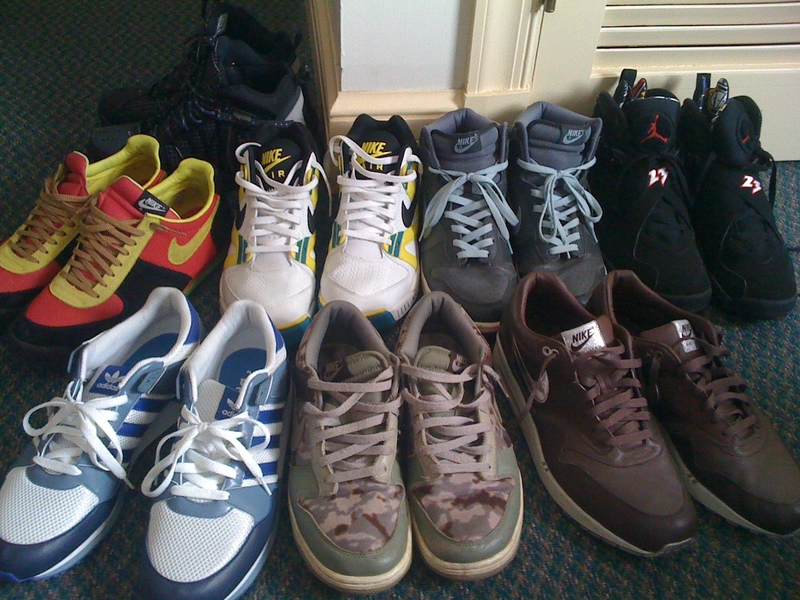 This is where the fundamental change is occurring within me…I now really want to wear all of my sweet kicks. No more hiding in the closet!!! (no pun intended.) Maybe I’ve turned into more of a sneaker…connoisseur, rather than sneaker collector. I know what I’m talking about when kicks are the issue, and I want to be able to enjoy these beautiful pieces of industrial design. Art that I can wear! As you can see, my love for the medium has not declined…it has simply shifted. Alas, all of my most amazing shoes are not here, so I will have to wait to put them on my feet. 😦 I took a handy snapshot with my iPhone of the small assortment of rubber soled footwear that I have hear at school. I’m really do love each pair shown, and they’ve all gotten a pretty decent amount of mileage, except for maybe the playoff 8s in the back. Come on! As you can see, I stick more to the swoosh, and not the stripes. Though that one pair of Adidas in there is my most recent purchase, and I really like them a lot! Anywho, those of you with an affinity for footwear, I wish that you would leave me a nice comment here, and let me know your thoughts on the whole issue! This entry was posted in Rashan's World, Shoe Game and tagged Adidas, boat shoes, Desert Boots, Loafers, Nike, Rashan's World, School, Shoe Game, Shoes, Sneakerhead, Sneakers, Wallabees. Bookmark the permalink.